Pop singer Rihanna’s tribute to her late grandmother, Clara ‘Dolly’ Braithwaite. Eyes clamped shut and teeth clenched into a disturbed grin, Abigail White lies frozen on a table. The smell of stale cigarettes circulates in the air. Psychedelic posters of Jimi Hendrix and The Beatles hang on the wall in organized chaos. The neon colors in the posters clash with the chipping green paint that has been carelessly and unevenly thrown onto the walls. Despite the noise of the room’s décor, all that can be heard is the sound of a needle, buzzing like a wasp’s nest as it scrapes across the top layer of White’s flesh. The needle drives into her skin at a pace so quickly that it doesn’t seem to lift from the surface. With one stroke of the needle after another, black ink replaces brown skin. White peeks through one corner of her eyes at the clock and then takes a glimpse of the “art” being drawn upon her hipbone. Her tear ducts become moist as if the sight of the needle makes it all the more painful. She fights back tears. Another glance at the clock, and the long hand that was once pointing to the two is now positioned at the six. White slowly stands and stares at herself in the mirror. “Never a failure; always a lesson. I love it!” she squeals. White, 20, of Newport, R.I., has just endured her third tattoo. Despite the pain accompanied with the $150 price tag, she it is pleased. Tattoo fever has taken over America, popping up in song lyrics and on grandmothers. As permanent body art becomes less and less stigmatized, it seems as though everyone is running out to get “tatted.” Even former U.S. President Theodore Roosevelt adorned his chest with the family crest. In a 2007 study conducted by the Pew Research Center, 36 percent of Americans ages 18 to 25 and 40 percent of those ages 26 to 40 had at least one tattoo. But why? Are tattoos just a fad? Or is there something more to tattoos that is prompting lots of people to mark up their bodies for life? You Mean, Fred Flintstone Had a Tattoo? OK, so maybe not Fred Flintstone, but maybe some of the prehistoric figures that inspired his character. While tattooing is heavily popular in today’s culture, the practice can be traced back to Neolithic times. 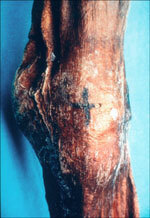 The oldest recording of tattoos on a human body was found in 1991 by hikers in the Ötztal Alps in southern Austria. The mummified corpse, known as the “Iceman,” is speculated to be about 5,200 years old, and an examination revealed 57 tattoos. These tattoos were later discovered by scientists to be markings of healing thought to help alleviate the diminishing health of the Iceman. Much like the Iceman, many people use tattoos today for a spiritual or familial connection, says tattoo artist and enthusiast Drew Owens of Providence, R.I.
An only child, Cassandra Means of Bangor, Maine, sought out a way to deal with her mother’s sudden death. Tattoo aficionado and pop sensation Rihanna recently tweeted a picture of her most recent tattoo in honor of her late grandmother, Clara “Dolly” Braithwaite, to her fans. “Goddess Isis- Complete Woman – Model for future generations- #GRANGRANDOLLY – always in and on my heart #1love,” the singer tweeted Sunday, Sept. 9. Poignantly placed beneath her breastbone is the Egyptian goddess Isis, the great maternal spirit. 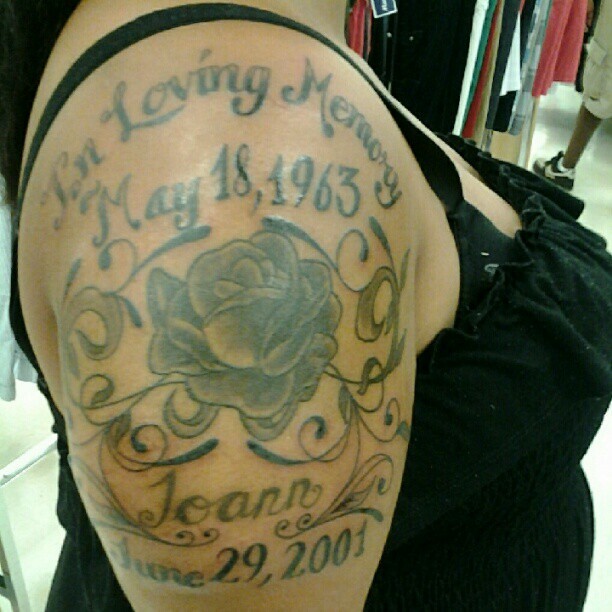 Cassandra Means’ tattoo tribute to her mother, Joann. While those like Means and Rihanna have meaningful tattoos, what about all of the other tattoos scattered across people’s bodies? You know, the symbols of cupcakes and cartoon characters and other seemingly nonsensical tributes. They can’t all be for “spiritual healing.” Right? The Pew study also found that 16 percent of people with tattoos have some regret after getting them, and that 11 percent actually have tried to remove the tattoos. Keisha McLeod, 32, of Newport, said that after getting married in 2004, she wanted to show her husband just how much he meant to her; however, in retrospect, it might not have been the best idea. One thing is clear about this $1.65 billion business. Fad or no fad, tattoos aren’t going anywhere. They are here to stamp the bodies of Americans one cross, one memento or one unfortunate slipup at a time.